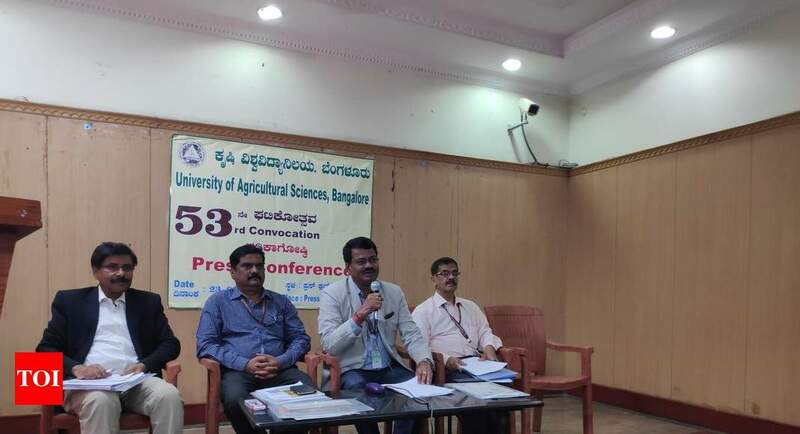 BENGALURU: The 53rd convocation of University of Agricultural sciences, Bengaluru (UAVS-B) will be held on Monday where as many as 1042 students will be graduated. The women students have emerged as the majority gold winners this year. Professor Baladev Singh Dhillonji, vice-chanceloor of Punjab University, Ludhiana will be the chief guest of the even who will be delivering convocation address and governor of Karnataka Vajubhai Vala will be distributing the medals for the graduating students. In PhD, eight women and six boys will be sharing 12 university medals, eight Donor’s Gold Medals and four Donor’s Gold Medals Certificates. Likewise, in masters programmes, 21 women and eight boys will be awarded with 20 university merit gold medals, four Campus Gold medals, 33 Donor’s Gold Medals and eight gold medal Certificates. In Undergraduate (UG) programmes, seven boys and 11 girls are sharing a total of 51 Gold Medals of which 7 are UAS-B Gold Medals, 03 Campus gold medals and 33 Donor’s Gold Medals and eight donor’s gold medal certificates. Mahablaeshwar Hegde, registrar of the university said, among 76 agricultural universities across the country, Bengaluru’s UAVS secured first position in ICAR-JRF awards 2018 wherein 56 students qualified for JRF under programme category of Agricultural Sciences and also secured Second Position with award of JRF to seven students under Engineering and Technology category. UAVS-B has five teaching campuses in Karnataka offering six UG, 22 master’s degree including MBA (Agricultural Business Management) and 15 doctoral programmes. Eight girls and six boys will be sharing 24 medals. Eight boys and 21 girls will be sharing 65 medals. Seven boys and 11 girls will be sharing 51 gold medals.